Nobody even thinks about it; certain foods are being genetically modified that even health nuts aren’t considering. Consider coconuts: There are more than 50 million tons of coconuts grown and produced every year, and 80 percent of them come from the Philippines, India, Thailand and Indonesia. Could many of those coconuts be absorbing cancer-causing radiation from the leaking Fukushima nuclear plant in Japan? How often do you check the country of origin when you buy coconut water? Well, that’s just the beginning of your search for toxins now, because it’s getting scary fast. 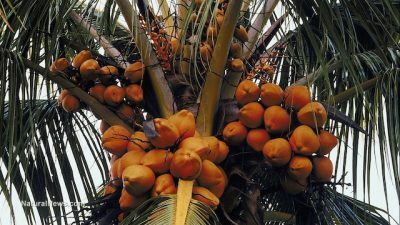 Biotechnology firms have already begun to work their evil in laboratories to create agronomic traits for coconuts so that they are resistant to insect pests, particularly the larvae of moths and butterflies. Right now, in Vietnam, genetically modified coconuts are being rolled out to change the characteristics of the composition of the fatty acids (the oil). Not only are field trials underway, but somehow, GM coconuts have found their way into American foods, including dessert items. So, certain coconuts now contain toxins that kill moths and butterflies, and surely the science journals will tout it, celebrating “science!” and how profits and production are now increased for the starving masses, who otherwise wouldn’t be able to find or afford anymore coconuts. Sure. And when the great flood, or drought, or tsunami hits the world, everyone will be saved by GM foods, supposedly, and everyone will also be dying of cancer and dementia, like those “pesky” bugs that eat “our” coconuts. You see, biotechnology corporations are doing everything they can to ruin the best, healthiest foods on the planet. Coconuts provide an excellent source of good fat, and the oil is known to prevent Alzheimer’s disease. Along with organic olive oil and avocado oil, coconut oil is one of the last pristine, clean oils fueling longevity. Coconut fat is found in chocolates and chocolate coatings. The water contains many vitamins, and makes a great substitute for drinking water where countries like the USA pollute the tap water with fluoride. Coconut is also a constituent of cosmetics, such as in soaps, shampoos, creams and body oils. How soon will GM coconuts become the norm, like GM corn, GM soy, GM canola and GM cottonseed? If you don’t read the labels on every single food, beverage, medicine and personal care product you buy and use right now, you had better start. Even your desserts should be made with quality, non-radioactive, non-GM ingredients. If you consume toxic insecticide and carcinogenic herbicide day in and day out, don’t exclaim “why me?” if a doctor diagnoses you with cancer. More than 95 percent of cancer cases are totally preventable. Check that flan and that coconut water for the words “genetically modified” or “genetically engineered.” This is no science to brag about. There’s good science and there’s bad science. Know the difference!